BTT Price Analysis February 6: Strong first week, back on track after dip? As most in the crypto world are aware of the launch of BitTorrent Token on the Tron network last week, and the subsequent growth spurt the price of BTT saw, it seems only fitting to take a look at the technicals of the token's first week. 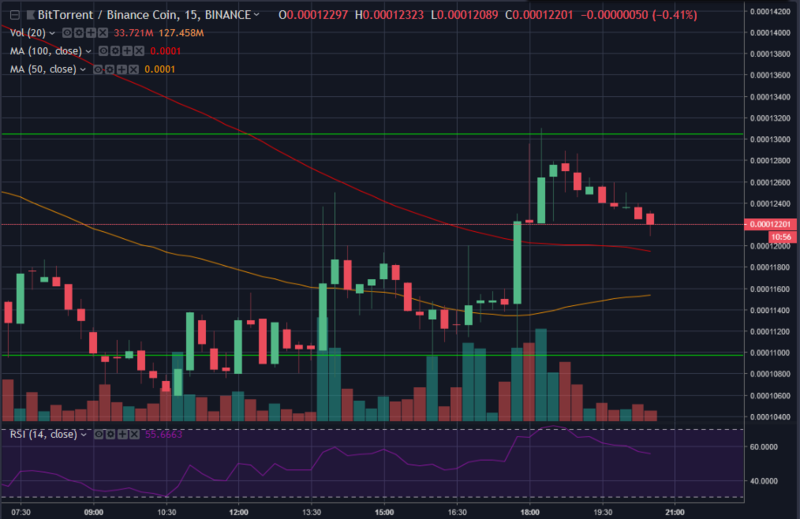 Obviously there isn't a lot of history so we will be focusing on shorter time frames than usual, and we will use the BTT/BNB pair on Binance as it has good volume. - BTT launched a week ago and the price initially performed very well, though there was recently a pullback. - After dip support was found at about 0.00011BNB, just above 100 HR MA. - Just rejected off 50 HR MA, but looking to retest. Most of the BTT price action happening can be best viewed on the 1 hour timeframe. Here we can see that the price seems to have found support above the 100 HR Moving Average, which is roughly aligning with 0.00011BNB, a psychological level with some historical precedence. The upper end of this channel also aligns with some historical pricing at about 0.00013BNB as well as the 50 HR MA, which we just got rejected off of. Zooming into the 15 minute timeframe gives us better resolution on the rejection and shows us that we do have some support from the 15 min 100 MA, which may provide enough pressure to let us retest up to the 50 HR MA. 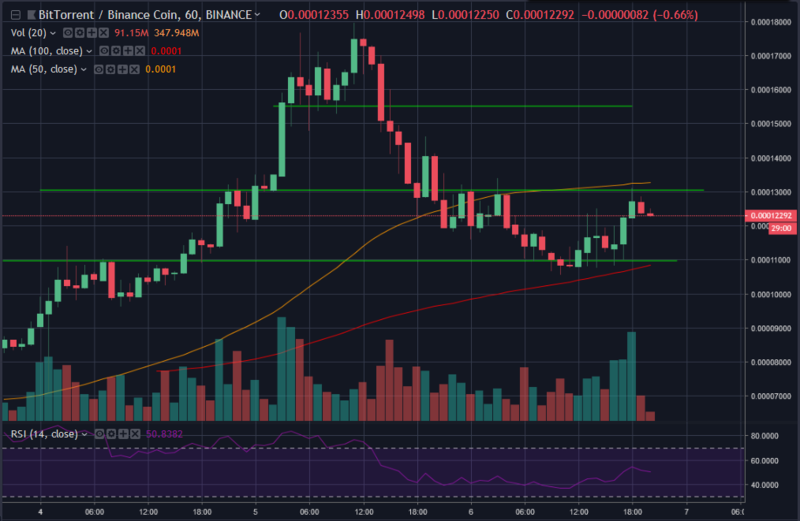 If the price can hold above the 15 min 100 MA and we can push back up above the 50 HR MA, then we could see the price test up as far as the next major resistance at about 0.000155BNB. If we fail to get above, then most likely the price will drop back to previous support at about 0.00011BNB. This token is still in its infancy, so actual adoption and usage has a long way to be determined. Still, BTT has received a pretty strong embrace in its first week on the market, so anything is possible. Stick here at Chepicap for all BTT price analysis and action! Read more: BTT - What is BitTorrent's new cryptocurrency token actually for? Can BTT continue on its ascent?